Mount Hood is a famous place to visit in Oregon. You can see the mountain from many places in the state. It is about 50 miles from Portland. You can drive from the city to the mountain in about one hour. Many people climb the mountain every year — almost as many people as Mount Fuji in Japan! Mount Hood is 11,249 feet tall. It is the highest mountain in Oregon. It is actually a dormant (sleeping) volcano. The mountain has 12 glaciers. It is always covered in ice and snow. People can ski all year long. Timberline Lodge is at 6,000 feet. It is a beautiful place to go skiing or hiking. Some people like to rest by the fire and enjoy the view of the mountain. The roads around Mount Hood are called “The Fruit Loop.” There are many farms and fruit orchards. They grow apples, peaches, pears, blueberries, cherries, and other fruits. There are also many lakes near Mount Hood. Visitors like to go camping and fishing at Trillium Lake, Lost Lake, and Mirror Lake. The air is fresh, and everything is beautiful. Native American people call the mountain Wy’east. They have many stories about the mountain. In the story, two brothers (Wy’east and Klickitat) love the same woman (Loo-wit). The brothers fight a lot. The Great Spirit wants to stop the fight. The Great Spirit changes the brothers into mountains. One brother becomes Mount Hood in Oregon. The other brother becomes Mount Adams in Washington. The beautiful woman becomes Mount Saint Helens. Do you like to visit the mountains? Write 3 or 4 sentences. Talk about what people do in the mountains. Forsha, Emily. “7 Wonders of Oregon: Mt. Hood.” Travel Oregon, Travel Oregon, 20 Nov. 2017, traveloregon.com/things-to-do/trip-ideas/7-wonders/7-wonders-of-oregon-mt-hood/. Haven. “Menu.” Gathering the Stories, 13 Jan. 2015, www.gatheringthestories.org/tag/wyeast/. (Adapted from Clark, Ella (1953) Indians of the Pacific Northwest (renewed 1981). The Regents of the University of California. “Mount Hood.” Wikipedia, Wikimedia Foundation, 11 Aug. 2018, en.wikipedia.org/wiki/Mount_Hood. “Timberline Lodge.” Wikipedia, Wikimedia Foundation, 11 Aug. 2018, https://en.wikipedia.org/wiki/Timberline_Lodge. 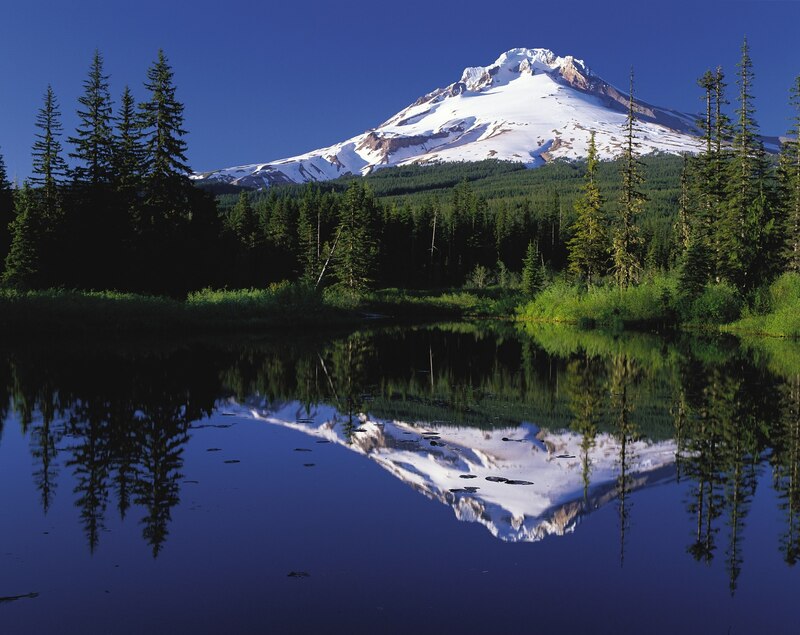 The image “Mount Hood Reflected in Mirror Lake” is in the public domain.